UK Stampin' Up! Demonstrator | make beautiful cards | Crafty Hippy: Best of.... Butterflies! This week is proving to be very exciting indeed! Tomorrow we see the launch of the new Annual Catalogue; and as it's the 1st July today we get to see this month's "Best of" stamp set. Which features butterflies! Each "Best of" stamp set features one new stamp (in this case the butterfly that fits the Elegant Butterfly Punch) and the others stamps in the set are favourites featured from the last 25 years. As Stampin' Up! have only been in Europe for 5 years this means that many of the images in these sets have not been seen by us in the UK, making these sets extra special for us. 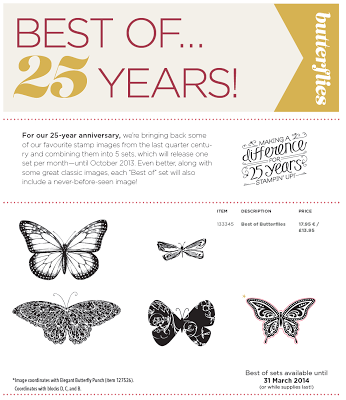 "Best of Butterflies" is available from today all the way through until 31st March 2014. Just get in touch with me if you'd like to order this set.